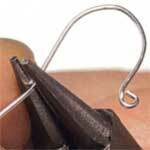 If you are into wire jewelry, then you might want to have the satisfaction of making your own fish hook earwires. 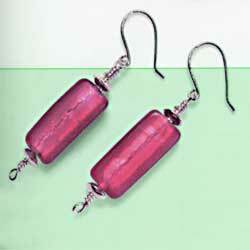 And with practice, your earwires will look as good (or better) than the commercial ones. Of course you can also buy a multitude of earring findings from costume ear components to quality & sterling silver earring components . 1) Cut 2 lengths of wire - approximately 5 cm (2 inch) long. 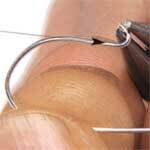 Bend the wire around a ballpoint pen - more length of one side than the other. 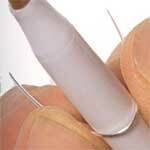 2) Use the tip of the round nose pliers to roll the end of the shorter side, back onto itself. 3) At the other end, gently angle the wire a little - forming the final shape you want (a bit concave inwards towards the loop you have just made with the tip moving away from the loop). 4) On the longer side, clip off any excess length you don't want with the wire cutter. As this is the end that will go through the ear, smooth the cut end with a cup bur or small file. 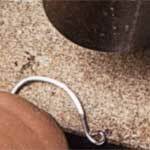 5) (optional) To strengthen your fish hook earwire, you can use a hammer & block to hammer the curved part of the earwire. Repeat steps to make the other earwire. Now you have acquired another technique in your wire jewelry making repertoire!